It’s been an interesting path to Vermont and Circle Strings. Adam attended college at the nearby University of Vermont, and later went to work in his Dad’s business, Circle Metal Stamping, in Mt. Vernon, New York (Westchester County). The company focused on making special dies and tools, die sets, jigs and fixtures, and industrial molds. During his time at this business, Adam became aware of other companies using CNC processes to manufacture parts for Circle Metal. To incorporate CNC for metals was going to be very expensive, as well as difficult to compete with China. “I also wasn’t thrilled about having to depend on weapons contracts for my future,” notes Adam. So rather than continue the business, as his Dad looked to retirement the family opted to sell it. It was there that Adam met Michael Millard of Froggy Bottom Guitars. Adam “took the leap and started building with them full time.” Froggy Bottom hand-finishes its instruments, but looks to CNC for the production of certain parts. 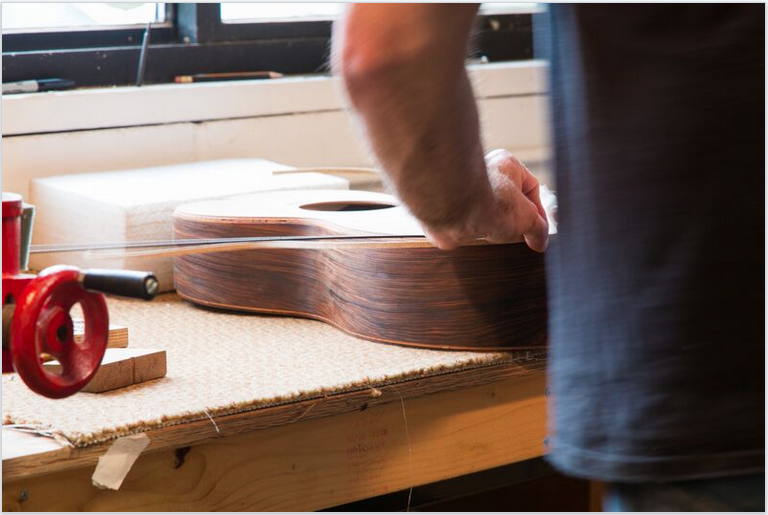 “It was an incredible experience and I learned so much about guitar building, dedication to a craft, hard work, and most importantly, myself,” notes Adam. 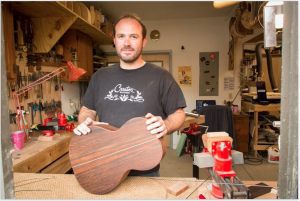 During his time at Froggy Bottom, Adam says that he learned the value of adding CNC to the process of making a guitar, in terms of the precision and repeatability that it offers. Next, Adam opened up his own shop in Burlington. 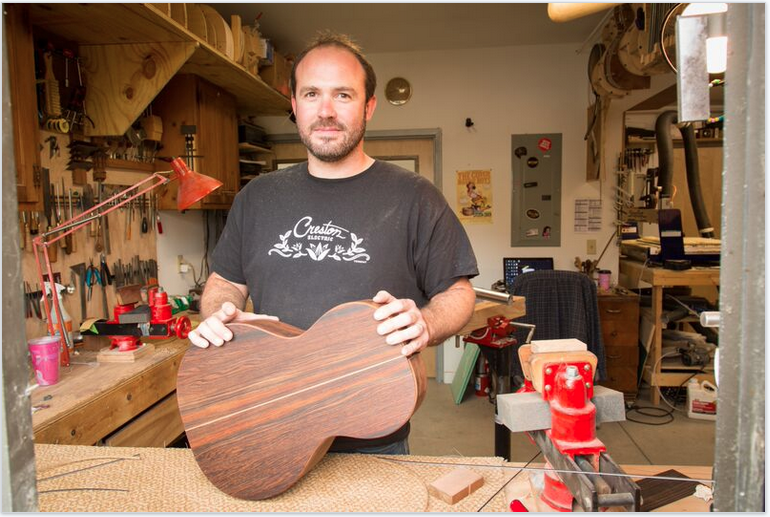 When he first opened up Circle Strings in Vermont, Adam was primarily making the instruments by hand (with all “traditional” shop tools), and buying his guitar necks from a manufacturer who used CNC. “Though I had initially looked down a bit on CNC, believing that anything less than fully handmade wasn’t really ‘handmade,’ I came to understand the role that CNC can play within a wood shop. It’s just another tool at my disposal that adds efficiency to my work. Adding CNC to my shop is a decision that allows me to sustain and grow my business,” said Adam. 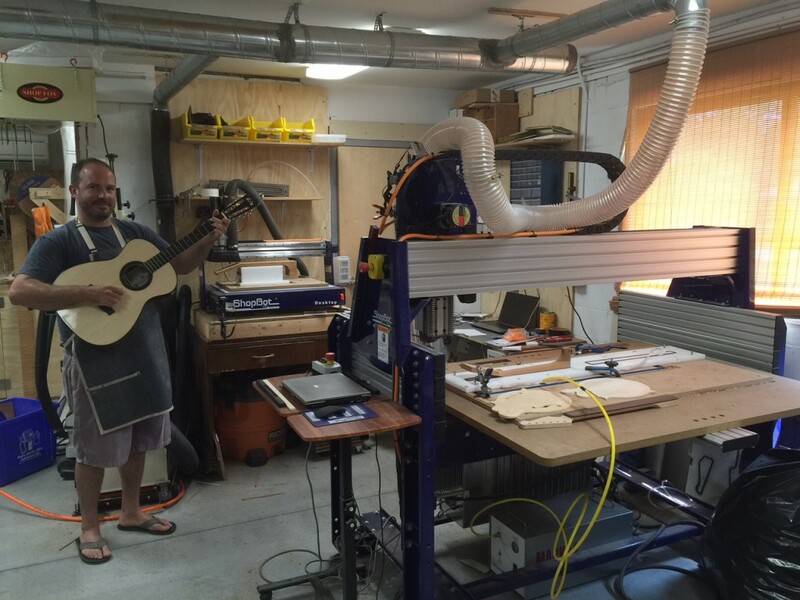 Adam serenades his ShopBot Desktop and ShopBot Buddy! 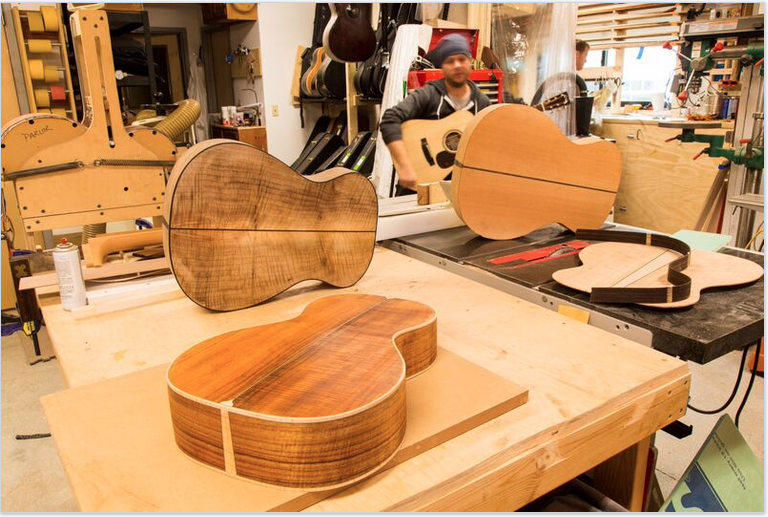 Circle Strings shares a building with Creston Guitars, where luthier Creston Lea builds electric guitars and basses in a classic American style. 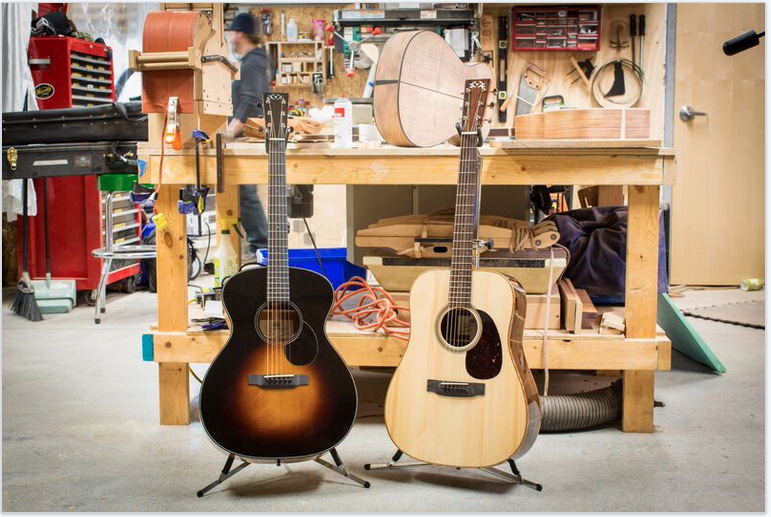 According to Creston’s website, “Creston Electric Instruments produces custom guitars, built one at a time by one person near the old barge canal in beautiful Burlington, Vermont. The guitars are finished to look like real instruments made by a real person, not poured out of a mold on the other side of the globe. 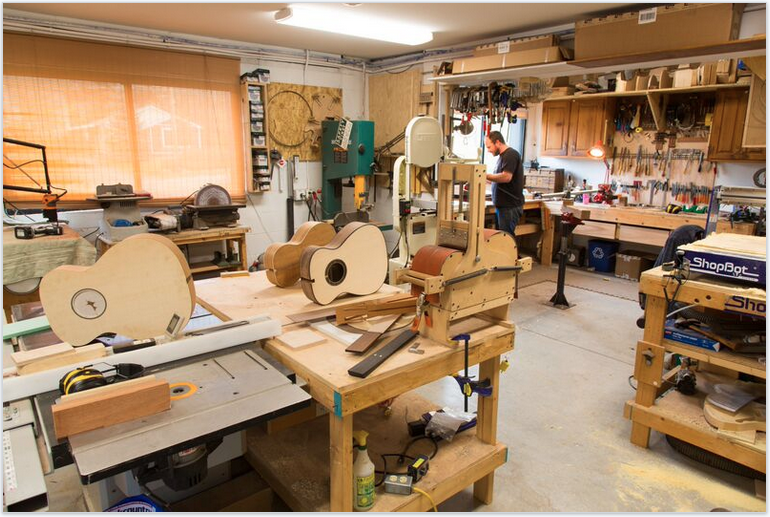 All custom guitars are designed in collaboration with the players who use them – professionals and beginners and in between.” The site notes that he uses CNC’d necks to start with and then hand-shapes and finishes them. These neck pieces are made by Creston’s neighbor Adam, on the ShopBot Buddy that Adam purchased last year.”I decided to purchase the Buddy to fit larger parts such as guitar necks onto the bed of the CNC,” said Adam. Learn more about Circle Strings at their website. You can find out more about the ShopBot Buddy here, and the Desktop tool here.